There's not only so many different cities and things in solidarity with OWS, but a growing poetry anthology. The poets and editors putting together the Occupy Wall Street Poetry Anthology are Stephen Boyer (author of chapbook Ghosts from bentboybooks and contributor to the anthologies Madder Love: Queer Men and the Precincts of Surrealism and Cool Thing: Best New Gay Fiction). He also wrote Life On Mars: The James Bidgood Story (shown at Poet's Theater in San Francisco) and Filip Marinovich (author of Zero Readership and And If You Don't Go Crazy I'll Meet You Here Tomorrow, both from Ugly Duckling Press). As of now three copies of the anthology are handmade by Stephen and Filip and can be found at the People's Library. This is sincerely a communal project that reflects the camaraderie and spirit of OWS in that no poems are rejected. All are welcome. All are accepted. I especially love that non-poets are sending in poems. Its sort of a dream that such a kind of anthology is in the making, one where a big chunk of the world could fit in it if everyone from the 1,500 Occupy cities sent in a poem. The OWS Poetry Assembly convenes every Friday at 9:30pm near the People's Library. How did you and other poets get involved with OWS since its inception? STEPHEN BOYER: I got involved with it by being introduced to Travis Holloway hours before the first Poetry Assembly. The first assembly was terribly wet but there was great energy. The following week Travis was busy and asked me to facilitate and I went in early and got hooked up with the library. Moments before the reading I asked around if people would want to create an anthology. The People's Library agreed to cover printing costs and everyone agreed we should be archiving the plethora of poets bringing work to the Poet's Assembly. The rest is rapidly becoming poetry history! FILIP MARINOVICH : My name is Filip Marinovich and I am the co-editor of Occupy Wall Street Poetry Anthology. I heard about the Friday night Poetry Assembly through Facebook and since I'm a poet I thought, wow, finally a way to enter, a port of entry, to commit to being at Liberty Park. I had passed through before but only as a nervous observer and I wanted to participate. I was so nervous about it but my friend poet Brenda Ijima said, "Let's go to the reading together," and so we went. At the first poetry assembly my name was picked first at random out of a cardboard box and I performed a poem for Tim Dlugos, a great gay poet who I wish was here but he died of AIDS. So many spirits of the dead are here. We are encamped at the edge of a mass grave, the world trade mass grave. We are here among other things to rescue the dead from being used as war fuel, their names and memories have been sullied enough and exploited to justify permanent war. They deserve their place in our democracy and help to protect the holy people's site of Liberty Park. After my first illuminating experience at Poetry Assembly I started to work as a librarian in the People's Library and since then I've been encouraging all friends to come here and take part. To come see for your self what's happening and not take anyone else's word for it. Yes. Welcome. 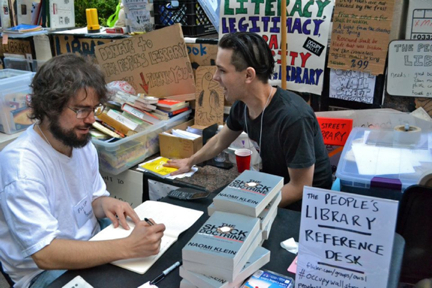 Tell us about the People's Library of OWS and the forthcoming OWS anthology. You mentioned it's coming together organically. SB: The People's Library is an amazing radical library. It's run by a great ever-evolving group of volunteers. Some of the librarians make it once a week, others practically live in it, and we even had "real life" librarians fly in to join in the fun for a few days of OWS vacation time. It's insane, the amount of books and donations the People's Library has received. It seems everyone agrees that a library is always something every community should have so it seems no matter how people feel about OWS they can agree to love the library. We have parent's bringing in children and all sorts of adults browsing the many different books we have onsite. You can see the books we have if you look up "the People's Library OWS." And we've even started to send boxes of books to other occupations so they, to, can have libraries. Every community should have an amazing library! And the People's Library is the coolest. One of our librarians claims that he went to every bookstore from the Village down and we're the only place you can get Trotsky. We also have authors sending us their books first! Not only can you get it from us first, it's free! It's like the Internet has become materialized. And if you really need the Internet you can get that too! We recently got Wi-Fi hooked up. The anthology came together really spur of the moment, like I said. It kind of happened just moments before the second Poetry Assembly. The demand for it is immense and poets far and wide from all over the world ranging in age and style are sending me their work. It's beautiful. I asked that we create an anthology that is massive enough to physically occupy Wall Street with poetry and if we keep growing the way we've been for the past two weeks it seems inevitable that all the banks will have to replace their money stash with printed poems! FM: Stephen is a genius of poetry camaraderie and he immediately sensed I would be excited about the anthology and I haven't had this much fun making a collaborative tapestry work since high school. The anthology is totally free of the usual petty partisan politics that we poets tend to divide and conquer our very selves with. We accept the work sent to us. The work is choral. It is the print analog to the human microphone. We are psychically echoing and playing variations on each others' waking dreams of being here at liberty. The grove of trees here is the Greek Akademia Democratic Polis grove of trees moving and the anthology pages are its leaves falling in the American Fall Wind. Welcome to Sherwood Forest, merry human. How is the process/making of the anthology different from other poetry anthologies? SB: First of all, we don't say no to anyone. Everyone that sends their work gets their work into the anthology. It's not that I'm against anthologies that are critical about what they print. It's just that this movement is a move toward inclusiveness and the Occupy Wall St. Poetry Anthology must reflect that. And this inclusiveness allows for a range of work that I've never seen. Children are sending their poems. Queer writers are sending their poems. Kids obsessed with hip-hop are sending their poems. Grumpy old men are sending their poems. Daydreamers are sending their poems. Professors are sending their poems. Homeless people without access to computers or places that put out calls for submissions are sending their poems. Famous poets are sending their poems. It's truly an anthology made of and by and for the people. It seems that someone from every walk of life is making space for their vision in the anthology. The anthology is also an ever-growing one. For now, every Tuesday I print up all the poems I received the previous week. Through Occupy Wall St. I've met so many amazing people and one of them is poet Filip Marinovich who has been instrumental in helping me keep sane as my email box floods with poems. He has been helping to edit the anthology (and by edit I mean neatly place all the poems with each other) and has been helping to envision the many possibilities it can grow. Filip is a beautiful amazing dreamer and consistently awakes me to the enormity happening in Liberty Plaza. The poems go into one of the three copies of the anthology living in the People's Library. Eventually the anthology will probably be published in a more accessible way but I'm not sure yet what that looks like. It'll depend on how large it becomes and will either be sectioned or published in editions. I'm not sure. I'm open to suggestions! Last night I was at a reading at a book binding collective space and now have a dream of hundreds of poets coming together to bind it ourselves. But we'll see. People have also been asking me if it'll end up online and most likely it will. But for now, we really want people to come to Occupy Wall Street and having the poems on display there will hopefully offer more incentive to get off the couch and hit the streets! I now live in the library. If you asked me if I'd move full-time to OWS a month ago I'd probably have laughed in your face but now I can't imagine any other place to be. If you want to help us make this anthology happen send poems to STEPHENJBOYER@GMAIL.COM and please put "Occupy Poetry" in the subject. Like I said, the anthology is updated every Tuesday so come in after the following Tuesday you sent poems to see its place amongst all the others. Photo of Filip Marinovich (left) and Stephen Boyer (right) with permission by Stephen Boyer.